Determine if your freight lane could receive cost savings by converting from truckload to domestic intermodal. We are frequently asked by newer domestic intermodal shippers about what makes a good shipping lane. To help answer this, we have compiled a list that outlines the main characteristics you should use to consider if your freight lane would be a good opportunity to convert to intermodal. The benchmark for where intermodal starts making sense is generally around 700 miles or more, but some intermodal lanes are competitive against truck at as little as 450 miles. The best intermodal moves have dray of 50 miles or less from the origin or destination ramps, although 100 miles or more can work. As the length of haul increases, so can the length of dray because the efficiencies gained on the line-haul can be offset economically with the dray. Domestic intermodal loads have a weight capacity of 42,500, but with proper planning opportunities for loads up to 44,000 pounds are becoming a possibility for intermodal shippers. Weight is the number one issue associated with intermodal shipments that cause issue for shippers. The typical intermodal transit is truckload transit, plus a day when the lane is within one railroad's network. If the ramp-to-ramp move requires the load to be interlined between two railroads, then the expectation is more truck transit, plus 2 or 3 days. 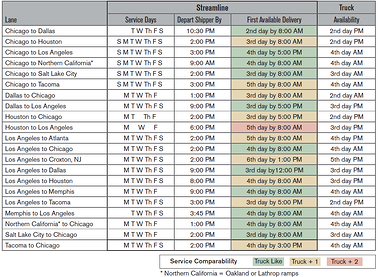 Listed below are transits of some major intermodal lanes compared against truckload. Intermodal has very few road miles, so the opportunity for theft is greatly reduced and looked upon favorably by insurance carriers for high value loads. With intermodal lanes having the rail ramp close to the final destination, there are greater opportunities for success on appointed on-time deliveries as compared to truckload options, making intermodal a great option for big box retailers. Intermodal can be used to either augment your truck's capacity, or it can be used exclusively for your capacity needs. With intermodal, it is easier to find the dray capacity to drop and hook or live load / unload in a very short period of time because a single driver can turn several loads a day and by routing several draymen the capacity is exponentially improved over truckload. 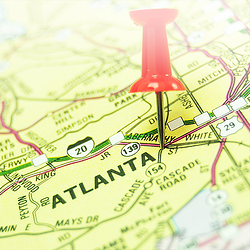 For some shippers, visibility is the holy grail of their supply chain. Intermodal visibility looks similar to small parcel tracking and tracing with a multitude of scans occurring throughout the rail transit. The information gives shippers more control and provides them more opportunities to use the information for a competitive advantage.